It is fulfilling and encouraging when you get the best out of your table saw. The important secret to doing so is by getting the best blade for your saw. There are various types of blades but for dado cuts, you will need to get the best dado blade set to achieve the finest of these cuts. There is a horde of retailers that advertise their blades as the best but how do you identify, which is the ideal dado blade you can afford. - Dado joint ﻿–a slot joint cut into the surface of a wooden material and perpendicular to the grain of the wood. - Tenons – a tenon is a projecting piece of wo﻿﻿od cut out for the purpose of inserting it into a mortise on another piece of wood. - Finger –﻿﻿﻿﻿ a finger joint is a cut made on the brink of a wooden material with the intention of joining it together with another piece. The cut is made on two separate wood pieces which are then glued together. These are not any regular cuts you are used tomaking. They are rather more precise cuts, especially in width and depth. They are mostly preferred when one needs to add a visually aesthetic appeal to construction. - Ripping blade – this kind of blade has very few teeth and a large gullet for removing waste pieces. It is used majorly for cutting wood along the grain. - Crosscutting Blade – this blade features more teeth than the rip blade and has a smaller gullet. It is used to cut wood with the grain for a smoother finish. - Combination blade- this one consists of a series of about four to five teeth characterized by a large gullet. It is used mainly to cut both with and against the grain and is also used for making miter cuts. - Plywood blade –as the name suggest this blade is used for cutting plywood and has very many teeth since plywood is thin and needs extra smooth cuts. - Diamond blade – this is a very sturdy blade that is designed for hard materials like ceramic, tile concrete and glass. - Abrasive blade – like the diamond blade, this blade is also relatively sturdy and is use for cutting tiles, masonry and sometimes steel. When you go to buy a blade for your saw or cutting tool, ensure that you choose the right one for the saw and for the type of material that you will be cutting. How to choose the best blade is a question that is most common among novices in the field of woodworking. There is a variety of blade options to choose from; there are a lot of designs, sizes, and configurations that can overwhelm anyone especially if they didn’t anticipate to be presented with so many options to choose from. You must choose the correct blade size for your saw. Otherwise, it might end up not being as efficient as it is supposed to be. First of all, when the blade is smaller than the saw it might not create depths into cuts made. On the other hand, the too big blade may end up giving you poor and inaccurate cuts. What is the ideal tooth count to consider? The best way to determine how many teeth will work for you is by considering the type of materials you will be cutting. If you are cutting thinner pieces, then go for more teeth but if you are focused mostly on cutting thick wood then go with fewer teeth. Better still, you can get both teeth e.g. a 48 teethed blade and a 40 teeth blade to use depending on the type of material you want to cut. 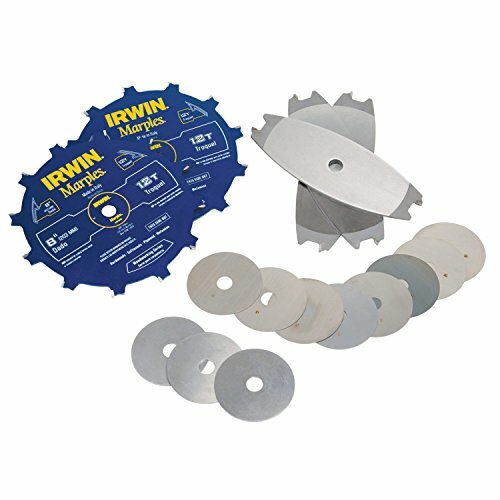 There are various saw blade materials to choose from. But despite the variety, you should always aim to get the best quality material dado blade. In the market, you will find steel blades, carbide blades, etc. However, if you want a durable and sturdy blade that won’t subject you to many replacements then buy a carbide blade. It is always important that you be aware of the cost of the various dado blades across the market. Make a cross comparison based on quality vs. price and decide what is best for you. Today you can get a good quality dado blade ranging at $80 - $200. Although if you are very conscious about the budget, you can also find dado blade sets that retail under $80 but the quality of these might be wanting. Freud is one of the best manufacturers of power tools and their accessories in the world as it stands. This Italian-born company is known for producing top quality tools and accessories, and this goes on from too many years ago. Their dado blade sets are just the best. Talk of quality, precision, and durability; this Freud 8 In. Professional stacked Dado has it all. 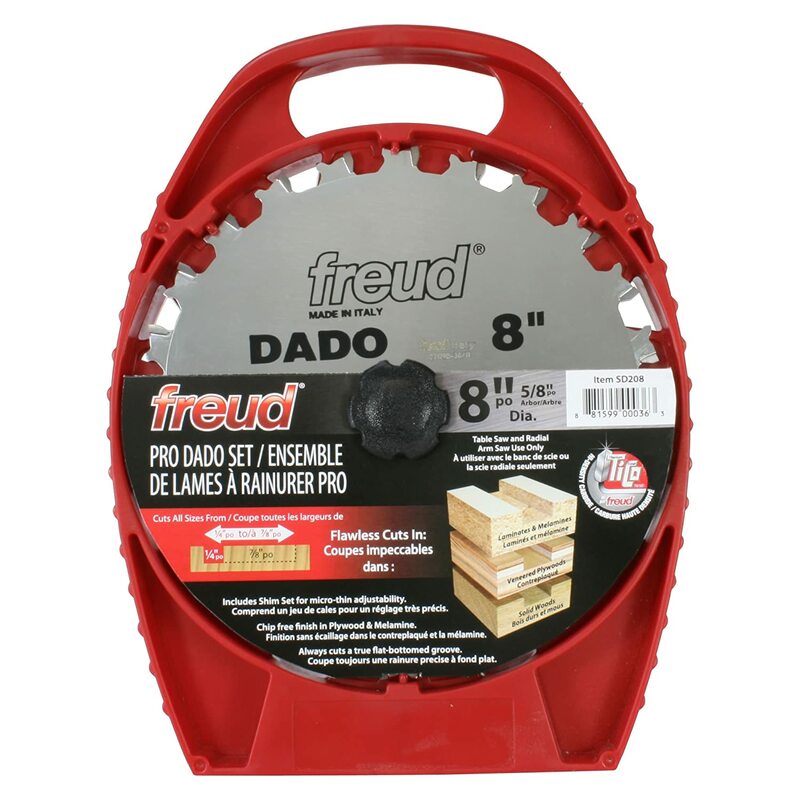 Provides superior and sustainable performan﻿﻿ce﻿﻿ –﻿﻿﻿﻿﻿﻿﻿ this dado blade by Freud biggest advantage is the durability and top performance it provides to users. We owe all this to the Freud’s Tico High-density carbide used in making the blade. The carbide material is engineered and manufactured by the company itself to give users a blade that makes clean, accurate and smooth cuts.Moreover, the material and design of the blade are such that it can withstand frequent sharpening but still maintain its form and precision. The blade is versatile – a good blade is one that is flexible to any type of material. Just like a good blade, you can use this professional stacked dado to make dadoes and grooves in most types of materials except non-ferrous ones.The versatility of this blade is characterized by its ability to cut grooves spanning ¼ to 7/8 inches. Saves you time and energy – with this blade you are introduced to fine adjustment features i.e. chippers and spacers that are designed to efficiently get rid of waste materials from the working area as well as smooth the edges of the material being worked on. This dado blade will give you accurate control when making dado cuts in work pieces as you can tune them for ¼ to 7/8 inches depending on whatever width you desire. This is an excellent dado set that is not just beautifully and durably designed, but it is also set at the right price. Are you the type of woodworker that is usually conscious about both quality and cost? If you are, then don’t worry as you have just landed at the right place. If you have been searching for a good quality dado blade that you can afford, then this DEWALT DW7670 dado set is just made for you. 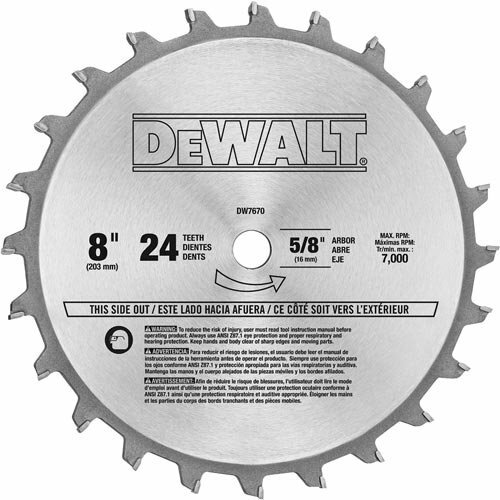 Being a Dewalt product, a brand that is also reputable in the power tools industry, the above named blade will totally impress you once you get to use it. Here are some of this features, benefits and cons. Provide you with accurate cuts – this blade is equipped with all features necessary i.e. the heavy gauge, laser cuts and the 4 tooth chippers that enable you to create clean, flat, precise and accurate dado cuts. Considers all safety precautions– In consideration to safety, DEWALT has provided users with an assurance of safety by providing along with the blade a storage case for storing the blade away when not in use. This in itself is important as it helps to store the blade safely and away from the reach of children.Besides, there is also the addition of anti-kickback fingers that prevents the blade from back cutting. This is also a good safety feature. Excellent tooth design and configuration – this Dewaltblade set features a Micro grain carbide teeth which helps to deliver clean and smooth cuts with minimal splintering. Versatility – just like the Freud 8 In professional dado blade, this blade by Dewalt is also adaptable. It can be used to cut most type of materials i.e. hardwood, plywood’s, laminate even better non-ferrous materials which the Freud model limits. Many customers have complained that the shims of this blade do not fit into the storage case properly. Generally, this is an excellent dado blade set for the beginning woodworker and cabinet maker. For the price, it is the go to blade for fine cuts on a wide range of materials. Based on the manufactures description, various reviews, and customer ratings, this dado sets seems to be an ideal blade set for those looking to get premium cuts at a pocket friendly price. With a retail price of under $150, this dado blade set is definitely a must have if you want clean, sharp and accurate cuts for your home improvement projects. Good quality blade – made with carbide, this 42 teeth blade is designed for quality and not just that, but it also gives you the best finishes. This professional grade C-4 carbide made blade will stay sharp for a very long time and will also cut through any type of hardwood, plywood, and softwood and even so, with ease. Easy to set up and use – for a beginner, this is the ideal blade to use for making dadoes, grooves and tenons. This products is supplied with clear and easy to follow instructions regarding which combination of blade to use for each cutting width.Also, the full body chippers make the use of the blade easy and convenient as it provides for an easy and less noisy operation when compared to blades with wing chippers. Makes smooth bottomed cuts – with the high number of teeth count, 42 to be precise, this particular dado set will give you the best smooth bottomed cuts with very clean finishes. A good addition to that is the ability to make the dado cuts ranging from ¼ -Inch to 29/32-Inch. The company prides in providing storage cases for the blade, although they are not of good quality. Therefore you will need to get a separate case for the blade. 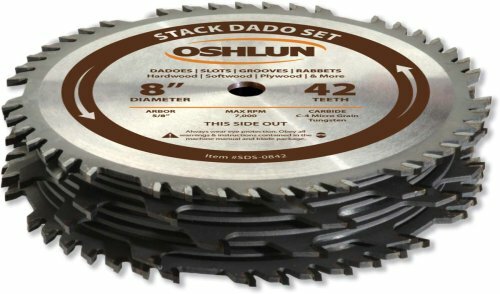 Sincerely, this Oshlun SDS-0842 8-Inch Stack Dado Set takes the day as the best dado set for the money. Although affordably priced, it still performs as though it were a high end blade model. 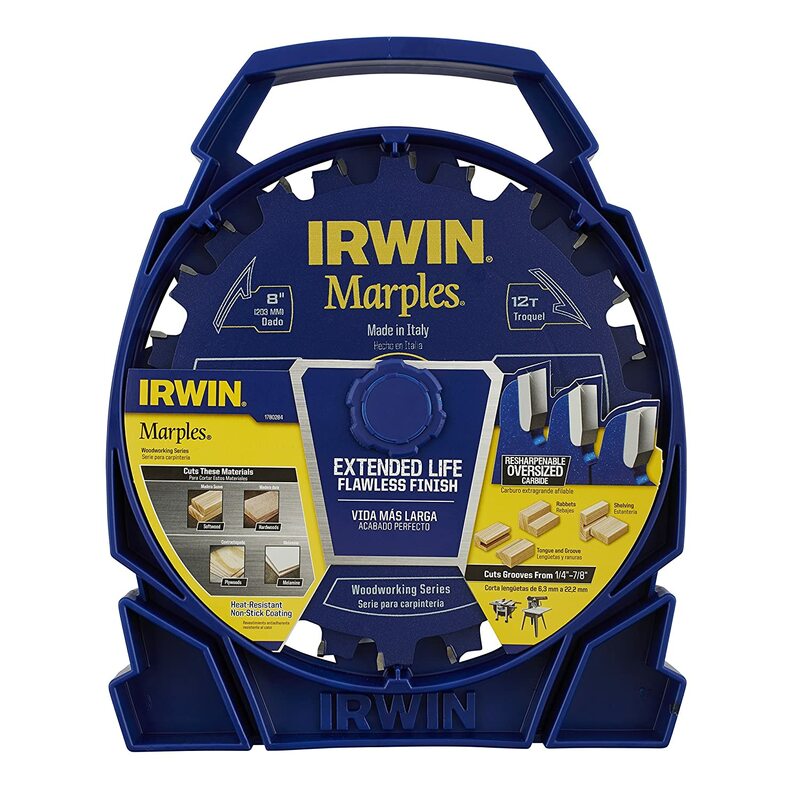 Just like the Freud, this Irwin Tool Marples dado set is also an Italian brand product. It is made with high standards fit for both amateur and professional woodworkers. As part of the Marples woodworking﻿﻿﻿﻿ series, this 18811865 dado blade is a product meant to provide users with high quality, accurate, smooth and clean cuts across most types of materials. It is fully packed with features that provide users with an amazing cutting experience for their woodwork constructions. Quality, durable and reliable construction – the overall design and build of this blade is of very high quality. The blade itself is made with carbide that is engineered in a highly automated state of the art facility and through a well-engineered procedure that assures users of the blades quality, cutting ability and longevity. Easy to clean and use – this blade features a heat resistant nonstick coating that helps to reduce heat caused by friction. This feature makes it easy to clean the blade after using it as well as enabling it to produce truer and cleaner cuts for a long period of time. Apart from the noise, this is technically the best cutting dado blade you will get at a price so cheap. With this blade, you can be assured of easy, smooth, clean and accurate dadoes, grooves, fingers, and tongues. However, remember to wear protective gear every time you use the blade to avoid injuries. If you have used a Freud’s blade or tool before you can attest to the exceptional quality input in the design and build of the brand’s products. Their SD500 series of dado blades is built with the same quality and cuts through everything. It is also packed with a unique feature that allows it to cut undersized plywood. 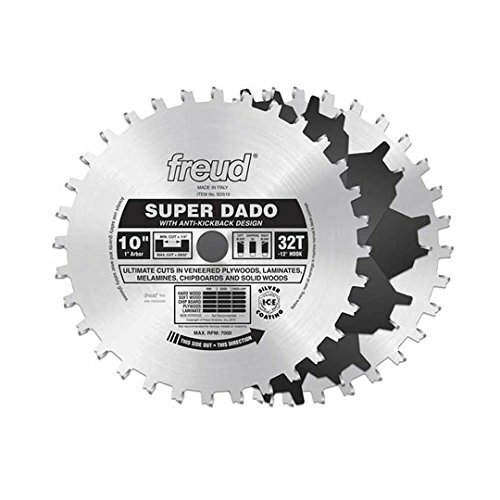 Makes very clean cuts – as expected of a quality dado blade, this 10 In super stacked blade will provide you with chip free flat bottom dado cutsin most types of hardwood, plywood and unlike our 1st Freud’s item on the list, this one can be used on non-ferrous materials. Easy to use for dadoes – regardless of the material, this blade set cuts through materials very fast and easy thanks to its strong and sharp teeth. Also, cutting through materials using this machine is effortless. You just need to place the machine on the work piece and push painlessly to get smooth and clean cuts. The downside of this blade is the chippers that come unlabeled which is quite confusing when you want to choose the right configuration of chippers for a given thickness. 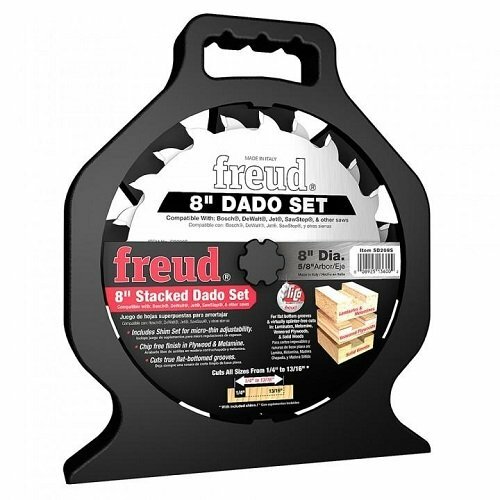 This SD510 Freud 10 inch super stacked dado set is the go-to product for those craftsmen that are willing to pay more to get more. The quality and performance of this blade are top notch to mention the ease of use and versatility. There is a magnitude of things you can do to keep your blade in good condition. Maintenance is not just for making the saw look good, but it helps to increase the longevity of the blade as well as enhance its performance. Here are tips on how to maintain your saw blade. Different types of materials and cuts require different types of blades. Therefore, ensure that every time you embark on cutting projects that you are using the right blade for the particular material. For example, dado cuts require the use of a dado blade to get the best cuts. In the same regard, you will use a blade with more teeth to make a dado cut in a thin material while a fewer toothed dado blade to cut a thick material. Before you start cutting, ensure that all the saw settings are tuned correctly. The fence and slots need to be aligned parallel to the blade. Also, ensure that you maintain the right blade projection (the distance from the top of the material to the upper part of the blade when cutting). Maintaining a proper blade projection will help you to get the best finish, one that is clean and smooth. To be able to cut accurately and quickly, you will obviously need a sharp blade. A blade with the right form of sharpness will give you not only accurate cuts but also clean and smooth cuts with fewer rough finishes. When you feel that the blade is blunt, you should make a point of sharpening them. And when doing so, always ensure that that the shop correctly matches the Pre-Score of the blade. Remember not to test cut with the blade in between sharpening as this may affect the blade’s sharpness. Also, avoid sharpening the blade now and then as it may also reduce the longevity of the blade itself. Dado blades and any other saw blades work best when clean. If you leave dirt, dust and any form of debris to build up on the blade, then you subject the blade to more friction. Constant friction causes pitch buildup due to a lot of heat production. A dirty blade will obviously give you a hard time cutting, will give you poor cuts and as a result of putting too much pressure during cuts you will end up shortening the life span of the blade as well as compromising its efficacy. Cleaning a saw blade is not difficult, you just need a cleaning product, spray bottle if the cleaner doesn’t have one, oil and a cloth. The best way to clean is to use a spray bottle with the cleaner. To clean; after you are done the cutting, remove any small pieces of the material from the blade and spray the cleaner on it. After that, rinse off the cleaner and wipe the blade clean. Oil it well and then store it in a safe place away from the reach of children. Remember to turn off the machine and unplug it from the power source before cleaning it to avoid accidents. If your machine has a lock the better; just lock the switch so that you don’t accidentally turn it on when during cleaning or storage. Importantly, choose your cleaning products wisely. The wrong cleaner choice may end up damaging the blade, and you don’t want this to happen. There is a variety of product in the market. Just search for the best one on the web or visit your local store for the best blade cleaner for your dado set. When choosing a cleaning product, avoid anything flammable. Also, do not just settle on any cleaner but rather buy a specified tool cleaning product as these have very minimal safety risks. It is true that power and hand tools tend to cause accidents which can turn out to be fatal when not used correctly and carefully. If it’s your first time to use a saw or any power tool, ensure that you maintain safety precautions at all times. Most power tools have these precautions indicated in the user’s manuals or label. Check them out and observe them to the latter. All the dado blades mentioned above are the best there are in the market today. So if you want a blade for your saw be it a radial arm or table saw, then consider our top 5 list above. Additionally, if you want to explore other options be sure to follow the given considerations as a guide to help you choose the best quality dado blade that you can afford.